"Sampath Speaking" - the thoughts of an Insurer from Thiruvallikkeni: Twitter troll ~ Viru Sehwag blasts Piers Morgan ~ and what a six !! 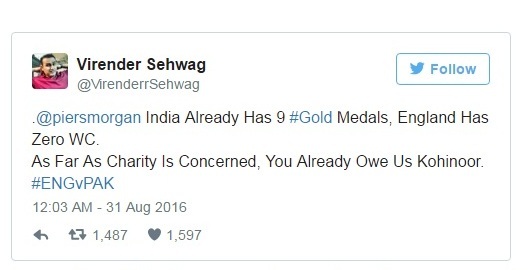 Twitter troll ~ Viru Sehwag blasts Piers Morgan ~ and what a six !! In Oct 2015 : His retirement message reads : To paraphrase Mark Twain, the report of my retirement yesterday was exaggerated! However I have always done what I have felt was right and not what conformists thought to be right. God has been kind and I have done what I wanted to do - on the field and in my life and I had decided sometime back that I will retire on my 37th birthday. His dashing ability were often associated with audacity, and lack of footwork – but if one could score the way, he did, footwork became meaningless. In a Test at Lahore, he ended up the day unbeaten on 96 – of which there were 20 boundaries – 15 on the off - upper-cuts to third man, glides and square-drives through backward point, and crunching drives through cover. He had a big partnership threatening the best for Indian openers but was out at 410 having made 254 off 247 balls with 47 fours and 1 six. In Internet slang, a troll is a person who sows discord on the Internet by starting arguments or upsetting people, by posting inflammatory messages in an online community ~ and many a times British display their audacity, imagining that the Sun still never sets on their empire ! Piers Morgan, is a British journalist and television personality currently working as the US editor-at-large for Mail Online. He was earlier hosting Live show on CNN. Yesterday at Trent Bridge, Nottingham, England created history against Pakistan in ODI no. 3773 – it was not the margin of win 169 runs but the total 444. The previous high was 443 by Sri Lanka against Netherlands in Amstelveen in 2006. Alex Hales who played so well also set a new England record scoring 171 beating the earlier 167* by Robin Smith against Australia at Edgbaston in 1993. England had reasons to celebrate ~ but not overdo as Piers Morgan did. The British journalist found himself on the wrong end of a social media trend (again) last week after he tried to troll Indian sports fans, asking them about the country's woeful performance at the Olympic Games. He quickly discovered the ire of the scorned Indian sports fan, and several thousands of them took to Twitter to blast Morgan. Among them was novelist Chetan Bhagat and former cricketer Virender Sehwag. ✔@virendersehwag responded : We cherish every small happiness', But Eng who invented Cricket,& yet2win a WC, still continue to play WC. Embarrassing? This time it was too irritating remark which read : Hi @virendersehwag, I bet you 1 million rupees to charity that England wins a ODI World Cup before India wins an Olympic Gold. Accept? Interesting !! In ODI – England has scored over 400 twice, India has done 5 times. England highest individual total is this 171 ! ~ Sachin Tendulkar breached 200 in 2010 and there have been 5 more instances of 200+ .. the list is Rohit Sharma (264 & 209); Martin Guptill 237; Virender Sehwag 219; Chris Gayle 215.